The Hanging Gardens of Babylon were one of the Seven Wonders of the Ancient World, and the Walls of Babylon were also famous. 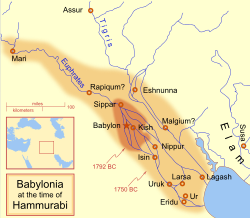 During the reign of Sennacherib of Assyria, Babylonia was in a constant state of revolt, and was suppressed only by the complete destruction of the city of Babylon. In 689 BC, its walls, temples and palaces were razed, and the rubble was thrown into the Arakhtu, the sea bordering the earlier Babylon on the south. This act shocked the religious conscience of Mesopotamia. After the murder of Sennacherib by two of his sons, his successor Esarhaddon hastened to rebuild the old city. He was crowned there, and made it his residence for part of the year. ↑ Bradford, Alfred S. 2001. With arrow, sword, and spear: a history of warfare in the ancient world, 47–48. Greenwood Publishing Group. ISBN 0275952592. ↑ Saggs H.W.F. 2000. Babylonians, p 165. University of California Press. ISBN 0520202228. This page was last changed on 15 November 2013, at 19:34.